I was very happy when I finally had the opportunity to sample Pinkus Jubilate Dark Lager. This is not necessarily a rare beer, but distribution channels in my area have been so confused for the past few months that it's been difficult to get ahold of a wide variety of rather nice beers. Jubilate is a very pleasant brown with vague hints of red. From a distance, one might assume that it would have ruby characteristics when held up to the light, but instead it maintains its browness with a calm, steady confidence that is refreshing to find in a dark lager. The head is stark white, thick, and has a very nice, lasting retention, leaving a healthy lacing. Try not to drink this beer too cold, as it mutes some of the excellent subtleties of its aroma. At first, I had a tough time smelling anything of substance, but after a few minutes of warming, I smelled plenty of nuts and yeast. As I continued drinking, the aroma became a pleasant, mouthwatering precursor to this delightful lager. It has a medium body with a pleasant effervescence, a slight tartness to it, and mild hop flavors. This beer is incredibly drinkable and a very excellent example of a dark lager. As a bonus, Pinkus beers are organic. It certainly deserves all five of the stars I can offer it. 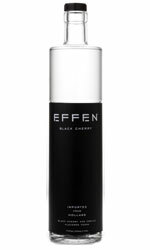 I'm not usually a big drinker of vodka, especially infused or flavored varieties, but the other night my curiosity got the better of me and I asked my favorite bartender to pour me a sample of Effen Black Cherry Vodka. In appearance, it looked exactly like one would imagine: colorless, transparent, and very much like water. The aroma, however, was shockingly filled with cherry. At first I wanted to say that it smelled like Cherry Coke, but almost immediately it brought to mind the wonderful feeling of biting into a fresh cherry, right off the tree. I was eager to taste it. It's hot, of course, being 80 proof, and it tastes strongly of real cherries. There's a sour flavor, perhaps some sort of acidity from the alcohol, but it can't mask the cherry completely, and the sweet, fruit flavors linger pleasantly in the aftertaste. I tried it alongside another well-known brand's cherry vodka, and Effen easily won. The other was saccharine, sugary, and fake. Effen tastes like the real thing, and so for your next cherry-flavored drink, I'd advise giving it a try. Wow. Wow, wow, wow. Some beers are big, and really grab you by the gonads and shake you fiercely. Bourbon County Stout from Goose Island Beer Company is one of those. It starts out as black as sin, so dense that light doesn't penetrate. This mysterious, midnight brew is topped by a thin, fine brown head that doesn't stick around for very long. It smells like bourbon and candy, with strong notes of molasses and hints of honey. You can get a whiff of the alcohol from across the room, too, I'd wager. "Oh boy!" I proclaimed upon tasting this stuff. It's a thick, chewy beer with a strong, solid body and big, dark malts. It tastes of molasses, black licorice, oak, and an almost cloying sweetness. The alcohol, though it's just 11% ABV, is hot and lingers throughout the aftertaste, which is really not unlike that familiar bourbon burn. This is an impressive imperial stout, though I have to admit that it was perhaps a bit too much for one sitting. I think two people could easily share a 12oz bottle of this stuff, and it is probably best served in a snifter. Overall, an interesting beer experience! By the way, for those interested in tasting this beer, we'll be opening it this evening at Bear Creek Beers. I didn't realize we'd gone so long without articles! Well, I've got lots of notes, and will begin posting reviews and things again, starting with a rather disappointing experience with Bison Brewing's Farmhouse Saison. This beer is getting pretty good reviews in other places, and has won a number of awards, so I'm really hoping that I just got a bad bottle, and that my experience doesn't reflect on all of this saison. Saison, or farmhouse ale, is one of my favorite styles of beer. There are some pretty nice American offerings in this style, most notably from Ommegang Brewery and Wolaver's, and the former's Hennepin is a formidable opponent. Now, Bison Brewing's saison starts out pretty nice. It is a lovely gold color, though seems to be lacking the richness of color that I expect in a saison. The head was not the exciting, thick foam I was expecting, either, and had rather rotten retention. The nose was slightly sour, which could have been a product of the yeast. It was sort of flat and boring, and had an aroma that reminded me of poorly made homebrew. (Actually, it reminded me a bit of the smell of my own homebrew, which was never very impressive.) After the tepid head and sour smell, I wasn't very excited about drinking this stuff. Indeed, it failed to impress. It was bland, sour, and lacking the body and earthiness of a good saison. There was a very strange bitterness in the finish that I couldn't quite place, and a sort of odd effervescence. My suspicion is that the bottle conditioning in this particular bottle didn't go exactly as planned, so I'll try another one sometime soon. Let's all cross our fingers and hope for the best, eh? This page is an archive of entries from December 2008 listed from newest to oldest. November 2008 is the previous archive. January 2009 is the next archive.